Corn factor and cotton spinner. In 1832 he started his own business as a Baker and Provisions Dealer in a small shop on the corner of Simpson Square. As his business grew he moved to premises at 121 Deansgate as a wholesale flour dealer. Brother of Richard Harwood, Mayor of Bolton 1863-64. Grandfather of John Percy Taylor, Mayor of Bolton 1934-35. He was a partner in Harwood and Walmsley, building Woodside Mill, Great Lever in 1859 with Thomas Walmsley, Mayor of Bolton 1869-71. Overseer for the Poor in Heaton 1830 – later an Overseer for Great Bolton. Represented Exchange Ward 1840-46 and 1852-58. Alderman for Church Ward 1858-59. Bradford Ward 1859-70. Chairman of the Watch, Fire and Police Committee for 6 years and Chairman of the Finance Committee. Took a prominent part in the Waterworks movement in 1846-7 and was an original Shareholder in Bolton Waterworks Company and Bolton Baths Company. Supporter of the Mechanics Institute. His house, Woodsleigh, was built on the site of the farm where he was born. Unitarian - he attended Moor Lane and Bank Street Chapels. John Harwood's link on the Mayor of Bolton's Chain of Office. 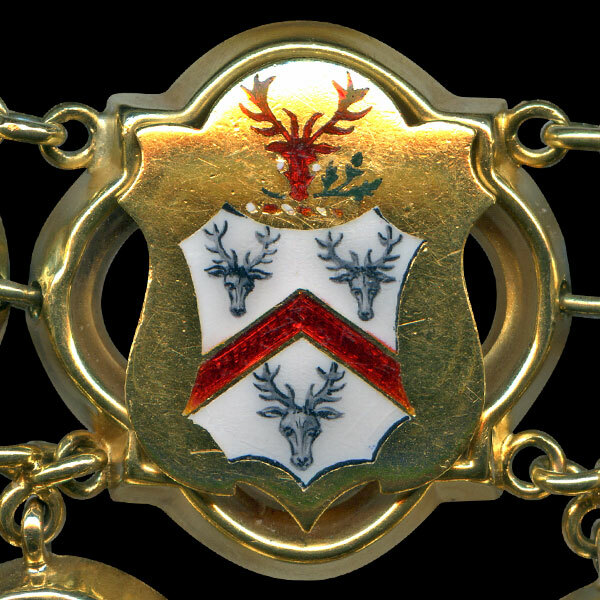 Argent a chevron gules between three stags' heads caboshed proper. Crest - On a wreath argent and gules a stag's head caboshed within its mouth a branch of oak vert. Several Harwood arms have similar coats but no proven source found.